As the story goes, a group of London designers got together to create a series of unique furniture pieces based on the Brothers Grimm's fairy tales. And the Wolf Within Shadow Chair is what Chris Duffy came up with. 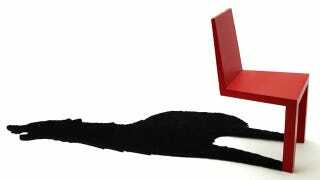 For $1,500 it creates the illusion that the magically balancing chair is casting a wolf-shaped shadow, but the black silhouette is actually a faux fur rug. And we think the chair's inspiration—the Brothers Grimm—might be an illusion too. Given how popular those Twilight books and movies are, we think the designer might also be a fan of the tween-friendly saga. That, or Michael J. Fox's greatest cinematic achievement, Teen Wolf.